13 Free Big Data Tools For Advertising Agency New Business - Peter Levitan & Co.
Talk with any CMO or marketing director and they will tell you that they receive buckets of incoming business development messages and content from advertising and digital agencies. Cool agency magazine-like printed pieces. Emails that point the client to blog posts about you guessed it, pressing issues like Why Content Marketing Is Important. Live lobsters. Yes, I know of an agency that sent lobsters. Yes, the agency is based in Maine. Exciting agency award news (“Wow, we just won the Sheboygan Ad Fed Annual Badger Award”) and on, and on. Sorry, folks. This type of random outreach ain’t going to cut it. And, know what? You know that. So, why are you doing it? Oh, you say you’re not? 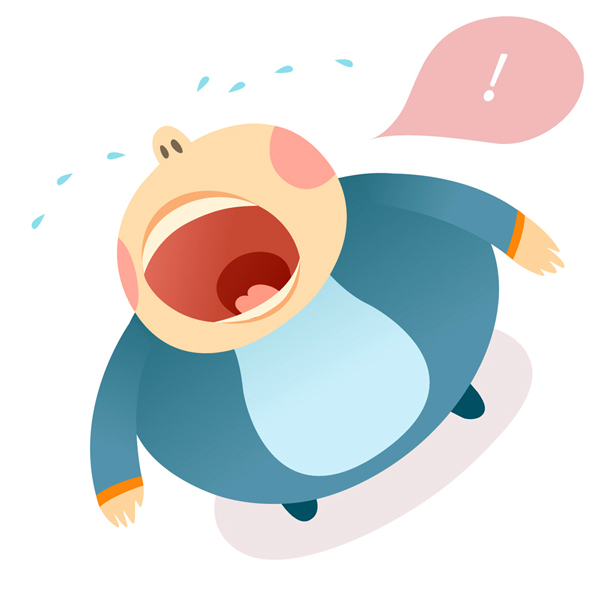 Sorry, I know you are because CMO’s tell me that you are. Talk to those cranky CMO’s and they will tell you that random does not work but when an agency does a good job of actually digging into their business, category or consumer to unearth some valuable (stress value here) insights, the client will actually pay attention and even smile. These insights work for you when they are relevant to the client’s business and personal needs. You are now helping the client do their job and helping them get ahead in their career. These are two benefits that will get you past meaningless message clutter to being able to make a personal connection. So, lets think about how to deliver relevance and value. I’ve been a closet Account Planner for years. I love the planning, research, insights and strategy side of advertising. And, I was lucky to have worked at Saatchi London when Account Planners ruled. It helped that we made a lot of money (great Planners are expensive), that the English are more cerebral than Americans and that they drink more. We would roll in the Planners at the start of major meetings to dazzle the client with their insights into the client’s business, competitors and consumers. It set up the great creative because the great creative was based on sound strategic thinking, which was based on those thought-provoking insights. You can grab a bit of this strategic planning magic for your agency and its business development program too. Remember, clients want to get ahead. And… Good news, for the most part, getting the data to create your dazzling insights is free. Your objective, and it doesn’t matter if you are a multinational or a local agency, is to get a very busy person to pay attention to you. To do this, you will show prospective clients that you have spent the time and energy to study their brands and categories (if you have prior category experience so much the better); have used strategic tools that they may not know exist and that you have unearthed a set of insights that are so valuable that they MUST meet with you to learn more. If your insights are actually insightful, potentially surprising and business building, then you should be able to use your sales prowess to get the meeting. My Portland agency Citrus worked hard on the insights front and delivered our targeted insights to our list of top key prospects via (yes we used the prevailing set of tools) micro-sites; customized white papers; in monthly emails and in books, postcards and letters (yup, paper works.). One of these books was a serious effort that targeted the healthcare market and ultimately delivered two major category account wins. Our “Gather Project: Social Media Snapshot Healthcare” study (you can see it below on SlideShare – and yes, the title was a bit clunky) leveraged free data and inexpensive interns to help us create a must-read healthcare document. It graded the major players in the healthcare market on their social media prowess at a time when social media was becoming a part of every marketing discussion. Our insights helped us look like category and social marketing experts, delivered valuable insights, pit brand against brand and broke way through the clutter of the usual agency incoming. What Big Data and Insights Can You Deliver? Every CMO, marketing and sales department will have their own pain points and information requirements. Tailor your insights to match the client’s issues. Importantly, make sure that you are not simply parroting what the client’s industry discusses every day. Your insights better be insightful. What do I mean by “insights”? The capacity to discern the true nature of a situation. The act or outcome of grasping the inward or hidden nature of things or of perceiving in an intuitive manner. A penetrating and often sudden understanding, as of a complex situation or problem. Here are some data-to-insights thought starters that can be customized by client and category. Compare competitor website stats including demographics, page views, unique visitors, seasonality, top keywords, etc. Isolate competitive search (i.e. interest) trends, seasonality from weeks to years, geography, search ranking, keywords, device usage and demographics. Track brand sentiment on Twitter and across blogs. Make a category-related case for mobile or social or native or radio or experiential advertising. Compare and contrast competitive brand positions and advertising approaches to find competitive messaging opportunities. In my early days of Account Planner worship, I was fortunate to work at a very large agency that had a research department and library. Today we all have access to an enormous research library – the Internet. Here are some tools and a look at how they might help you win the national Whole Foods account. There isn’t much I can add to what you know about search. However, there is one one trick that might help save time. I add “PDF” to my search phrases to help me find more valuable documents faster. 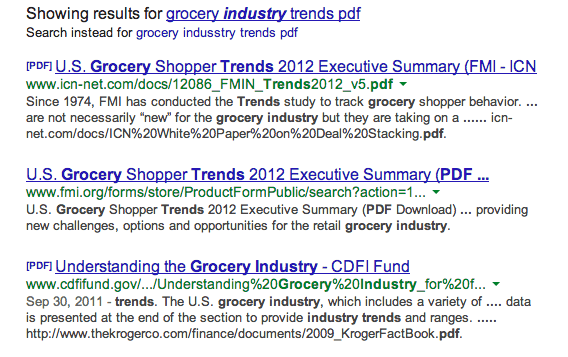 In the case of searching for information on the grocery category, I quickly get to some major industry studies. Google Trends tracks search interest in specific topics over time. You can search on multiple terms to makes comparisons. Need some insights into how Whole Foods should be talking about baby food? Ah, the SEO experts Holy Grail. The Google Keyword Tool helps us research the terms used in SEO. It also delivers relative interest in competitors, device usage and shows what other terms searchers are searching for related to the brand. 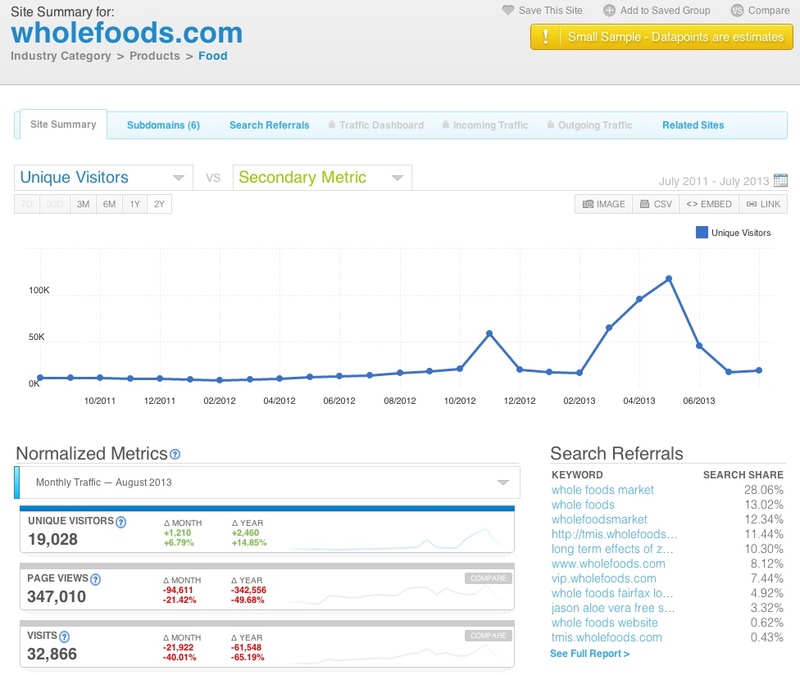 Note the number of searches for Whole Foods yet Safeway’s sales are double. Its clear that Whole Foods is a higher interest grocer – at least when it comes to Internet search. As a bonus, here is a really sweet SEO tool… SEO For Chrome sits on my tool bar and gives me a very quick snapshot of the power of any website. Play with it. Go to a Facebook page, click on Fans and Ta Da… Facebook gives you most popular city, weeks and age groups. Its not super detailed but it can provide good data for comparing competitor’s social media activity. Compete tracks a range of Website visitor trends including traffic, keywords and seasonality and you can compare multiple sites. Its like having Google Analytics for the rest of the world. Compete, and its competitor Quantcast, can deliver much more detailed information including demographics but these tools can get expensive. Try Compete for free for a day. 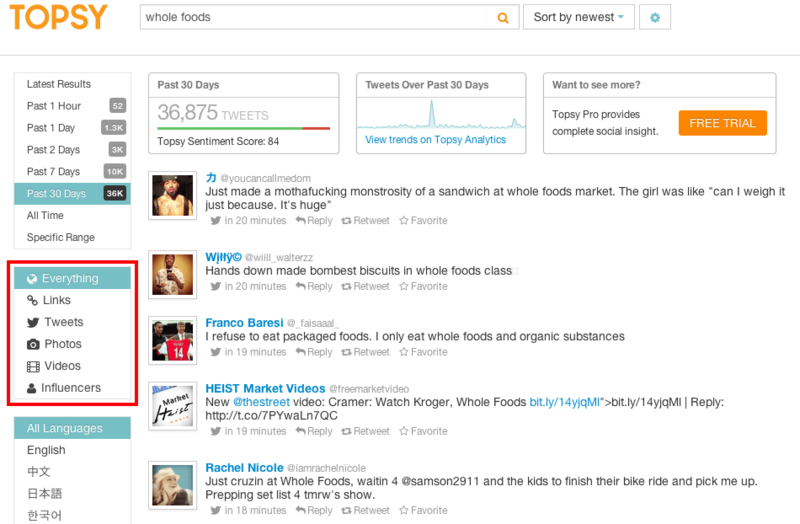 Topsy is a very cool Twitter analytics tool. It will show you what people are saying about a brand, number of tweets, sentiment score, influencers and more. 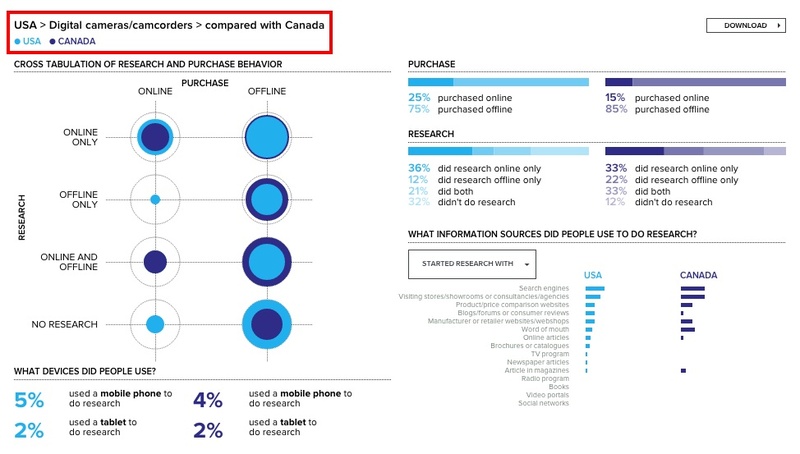 Consumer Barometer uses Google search data to help understand how consumers use search in their purchase process. As you can see, and it isn’t that surprising, consumers do not use the Internet for offline food purchases or before going to the supermarket. Categories like electronics demonstrate high search and Internet related research. However, one could make an argument that grocers could do a much better job of tapping into people’s interest in searching for food and nutrition information. Whole Foods does just that on its industry leading website. Take a look. 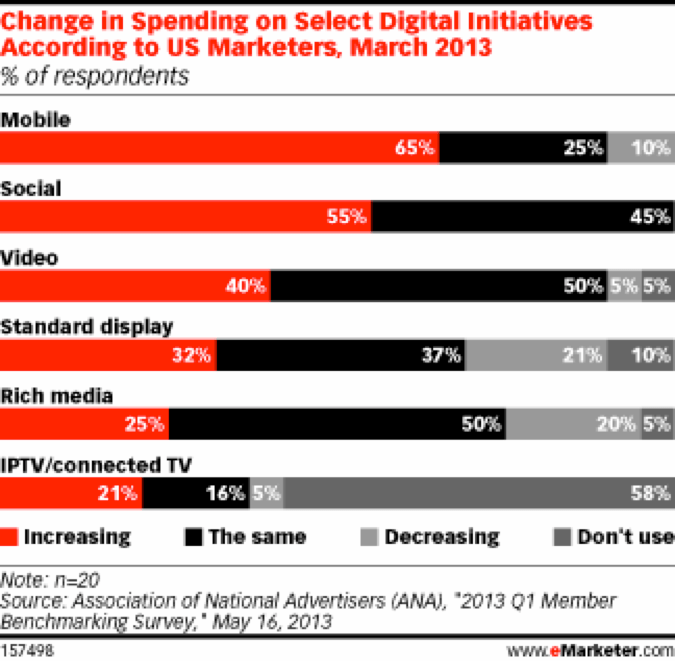 I keep a file of marketing graphs from eMarketer. The good news is that eMarketer sends me these in daily emails. I’ve used these graphs on this website to prove points like the fact that your ad agency better start to understand mobile marketing. Sorry for the digression away from groceries. I occasionally need to find examples of advertising or digital campaigns to make a point. Two of my favorites tools are the Digital Buzz blog which helps me to search across digital campaign types like games, mobile marketing and mobile programs and Ads Of The World which filters advertising by media, region, country and industry. 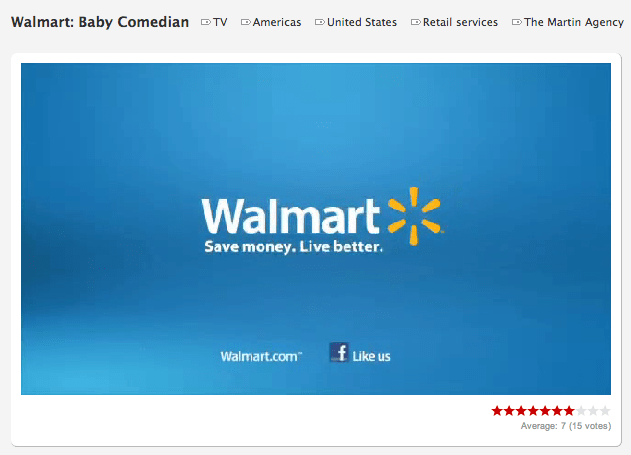 In this case, you could be making a case by asking why Walmart is the only grocer that is advertising on TV. If I am seeking information on industry trends, demographics and and the brightest minds on marketing, I use the Pew Internet and The Harvard Business Review. 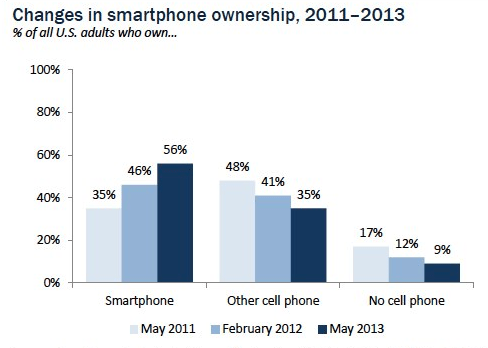 Two recent examples of valuable information for grocers are PEW’s Smartphone Ownership 2013 study that shows that 56% of American adults now own a smartphone of some kind and HBR’s article on women and mobile phone usage. If I need a stimulating jolt from other people’s thinking (OPT) I head over to Ad Age’s Power 150 list of advertising, digital and social media blogs and websites. AdvertisingAge’s #6 is Seth Godin’s popular Seth’s Blog. If you need to sound real smart at next week’s client lunch, head over to Godin’s early review of Malcolm Gladwell’s new book David & Goliath. 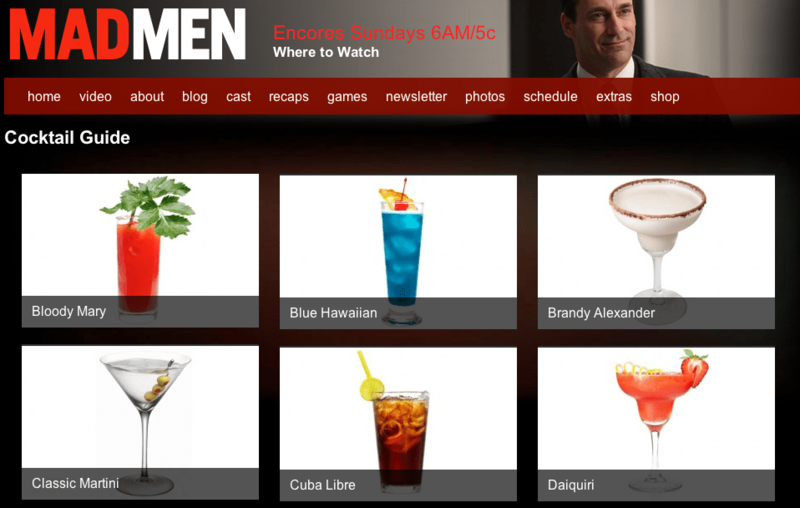 Just in case your data-driven new business program actually gets you that cherished client, I offer the Mad Men Cocktail Guide. I am not sure how I’ve gotten this far in my career without consuming this valuable data. I hope that I’ve stimulated you to think hard about how to deliver value to prospective clients. I’ve got more ideas rattling around my brain. To tap them, just take me up on my Corleone offer for 15 minutes of outstanding business development insights. Agencies from around the world have made this call. This entry was posted in Featured, Marketing, New Business, Smart Agencies and tagged big data, digital marketing, Internet, new business. Bookmark the permalink. Trackbacks are closed, but you can post a comment. Peter, thanks for another awesome column. Do you recommend developing insights into a category you’re pursuing, or do you zero in on a single client. Or both. Or something else altogether? I am objective driven. So, you have to ask — what do I want to achieve, for example, I want to get the attention of a busy executive. What do I know about him that will lead me to an insight that should get his attention and even get under his skin.